There is a bill - H.R. 213 Adoption Tax Relief Guarantee Act of 2009 that is in committee right now in congress that enables adoptive family to get a credit on taxes for their adoption expenses. If it doesn't pass, I have been told that it will go it will go back down to $5000 (this bill is for around $12,000 over a 5 yr period) This credit is what a lot of families rely on (including us) to use to pay off their adoption debt. http://www.govtrack.us/congress/bill.xpd?bill=h111-213 and to keep updated on it. Here is a link that will walk you through telling your elected officials what you think. You search by zip code for your officials and then if you hit contact you can use a web form to contact them. Details, Details, Details! God was very specific in these past few chapters we have been reading. One thing that stood out to me today was 8:30 when Moses took the oil and the blood and sprinkled them on Aaron and his sons to consecrate them. Just trying to picture that scene. The seriousness of it and the holiness of it. I wonder how they (Aaron and his sons) felt during this time…unworthy? in awe that they were the ones chosen? were they wrapped up in the moment? did the look out at all the people and feel such a burden for them? Were they worried about remembering all the details? I again, am so thankful for the sacrifice that was complete for us. I am thankful that we can go directly to God ourselves. I am thankful that I be in fellowship with Him all day long. I love that I can worship Him in the midst of my day and when I need to, fall on my knees and repent and have His forgiveness that moment—with no need of sacrificing- because the greatest sacrifice of all was made for me. 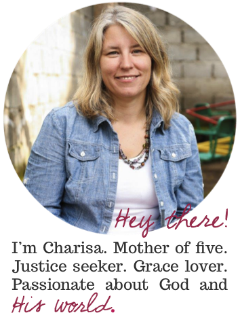 Charisa- may I have premission to copy your adoption law request and paste it to my profile/blog as well. I love getting this message out. Thank you! 1 Step Closer—Ever Shouted for Joy?